Five decades since the craze for Brutalism, most of the discussion about these buildings is about tearing them down. But the radical social vision that drove their rise has largely been forgotten. In 1966 Brazilian architect Paulo Mendes da Rocha, a pioneer of postwar avant-garde architecture, built a figurative middle finger in Sao Paulo’s villa district. His creation: two identical geometric houses made of exposed concrete, showing complete disregard for the stylistic norms of his more establishment neighbors. Just a few miles away, three years later, the University of São Paulo opened its Faculty of Architecture and Urban Planning. The building’s monumental concrete façade featured deliberately rough impressions created by unskilled workers, and was lauded as a brilliant expression of communist ideals. Today, alas, there is more talk about tearing down buildings in this style than building new ones. But this also reflects a change in the idea of what architecture is for. Far from today’s neoliberal orthodoxy, many Brutalist buildings expressed a progressive or even utopian vision of communal living and public ownership. Today, the battle to protect them is also a fight to defend this social inheritance. 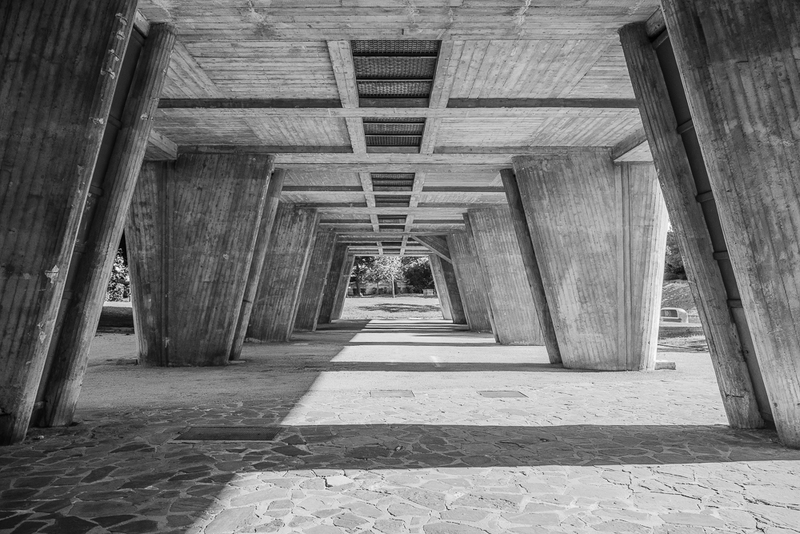 The term “Brutalism” originated in Britain, but also drew on the work of the French architect Le Corbusier. It was popularized in the 1950s by British architects Allison and Peter Smithson, together with the architecture critic Reyner Banham. The name refers not to the adjective brutal, but the French brut, meaning raw. Initially, “Brutalism” referred to architecture that openly exposed its structural and material elements. Buildings were made of brick, steel, or concrete: there was no plaster and no decoration whatsoever. Nothing should conceal what materials were used, how everything held together, and what purpose everything served. These principles made up the ideal of a radical honesty for postwar society. The root of the term was borrowed from art (Art brut) and from Le Corbusier’s term béton brut (bare concrete). The origin story tells us that during the construction of his Unité d’Habitation social housing complex in Marseilles (1947–52), Le Corbusier was faced with so many overburdened construction companies that out of necessity he decided to leave the huge concrete pillars roughly exposed in bare concrete. He called this method béton brut, and it would be a decisive breakthrough for the formal language of architecture into the 1960s and 1970s. From Corbusier, Banham, and the Smithsons, there thus emerged the building blocks of a Brutalist theory and aesthetics. At the same time, a new generation of architects were trying to break away from the functionalist aesthetics of their modernist predecessors. The boom-era surge in businesses’ spending power, the low cost of labor, and the Space Age’s heady belief in progress led to a desire for increasingly unique, sculptural forms, and ever-larger megastructures. For instance, the telecommunications center in Skopje, Macedonia, looks like an archaic vision of a space station; it openly puts on display its service core, staircases, and concrete support structures. The building’s materials and inner workings were not only exposed, but exaggerated and celebrated. Le Corbusier: Unité d’Habitation, Marseille, France, 1947-1952. After years in which they had been stylistically subordinate to scientific objectivity and functionalism, architects suddenly reappeared as artists — albeit with a continued enthusiasm for new technologies. For example, the Bank of London and South America used state-of-the-art air-conditioning technology and a sophisticated system of floors suspended from the ceiling. The colossal pillars from which the upper floors hang respond to the oppressive monumentality of the neighboring banks’ massive Classicistic facades. At the same time, the public sector faced a mountain of challenges. Rural exodus and the baby boom meant that cities were growing at a rapid rate. Millions in Europe were being drawn from simple dwellings into the modern world of the electric stove and central heating, all provided by the welfare state. While war-damaged inner-cities were still being rebuilt (sometimes also in a Brutalist style), vast new neighborhoods were being built in the periphery. With newly discovered (or rediscovered) enthusiasm for mega-projects, plans developed for social housing projects which would sometimes even house the population of an entire suburb in a single complex. Given its rapid spread, Brutalism can hardly be reduced to a single guiding purpose or political attitude. Seen in cultural centers from Austria to Japan, universities from Sydney to St Petersburg, post offices from Canada to Papua New Guinea, libraries, private villas, micro-houses, mega-complexes, churches, mosques, hospitals, hotels, town halls, kindergartens, and prisons — within fifteen years Brutalism had conquered the world. 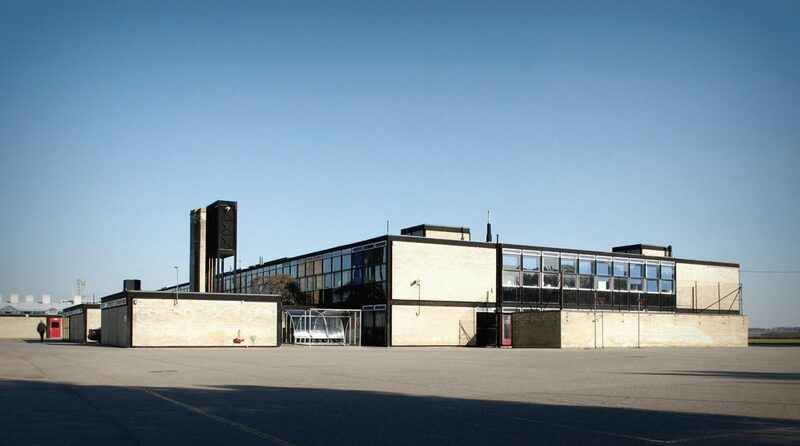 Alison Smithson / Peter Smithson: Secondary Modern School (now: Smithdon High School), Hunstanton, UK, 1949-1954. Architects were optimistic not only in their designs, but also in their expectation that the buildings would be adequately maintained. Yet the postwar economic boom and expansion of the welfare state was soon followed by the neoliberal period, and with it the obsession with “cost-optimization”: saving money. Many buildings were abandoned to their fate immediately after completion. Decay began quickly, as did changes in taste: at the time of its opening, Paul Rudolph’s Art and Architecture Building for Yale University had adorned the front pages of major architecture magazines. But even just a decade later, most of the original interior was remodeled beyond recognition. In the 1970s, amidst the oil crisis, the Vietnam War, and continued environmental destruction, the concrete giants became a stand-in for the idea of the establishment that had to be fought against. These buildings’ massive scale came to symbolize megalomaniacal architects and public-sector clients who had spent the glory years spending lavishly, building concrete mountains as monuments to their faith in limitless growth. When James Bond author Ian Fleming was looking for a moniker for a new villain, the name of Trellick Tower architect Ernő Goldfinger seemed a fitting choice. The massive expansion in social housing in the United Kingdom led to headlines about rampant crime in brutalist estates. Under Thatcherite austerity, the buildings, like their inhabitants, were more or less abandoned to their fate. The unappreciated Brutalist structures were systematically neglected until at a certain point they became nothing but eye-sores. Their abandonment became a self-fulfilling prophecy, to the point where they awaited only demolition. Of course, with so many different architects (only a few of whom would self-describe their work as Brutalist), climates, cultures, premises, and projects all associated with this one term, it was not just the price of maintenance that drew criticism of Brutalism. There were also failures that were rightly criticized: overly sophisticated floor plans that tested one’s sense of direction; absurdly segmented flat roof systems susceptible to leakage; inadequate steel reinforcement that caused difficult-to-repair damage to the concrete; monumental sizes that that disregarded their context, and the ubiquitous gray of exposed concrete, which suited professional architectural photographs much better than England’s perpetual rainy weather. But we might also risk throwing all of these big, gray, 1970s babies out with the bathwater. Sometimes truly brilliant examples of perhaps the most forward-thinking architectural style of the twentieth century are being irretrievably lost. What to Keep, and What Can Be Done? Fifty years have passed since Brutalism’s heyday, and the Oedipal reflex is slowly fading. The architecture of our parents’ age is slowly becoming the architecture of a generation of grandparents. But with distance comes the possibility of a new, less biased view. In many places, historical preservation has also begun to concern buildings dating to the 1970s. This work is being encouraged and supported by an ever-increasing number of initiatives. Increased interest among young architects, numerous books on concrete architecture today appearing in surprisingly high print runs, and the stunning social-media popularity of photos of these buildings all indicate that a rehabilitation of Brutalism’s image may well be underway. 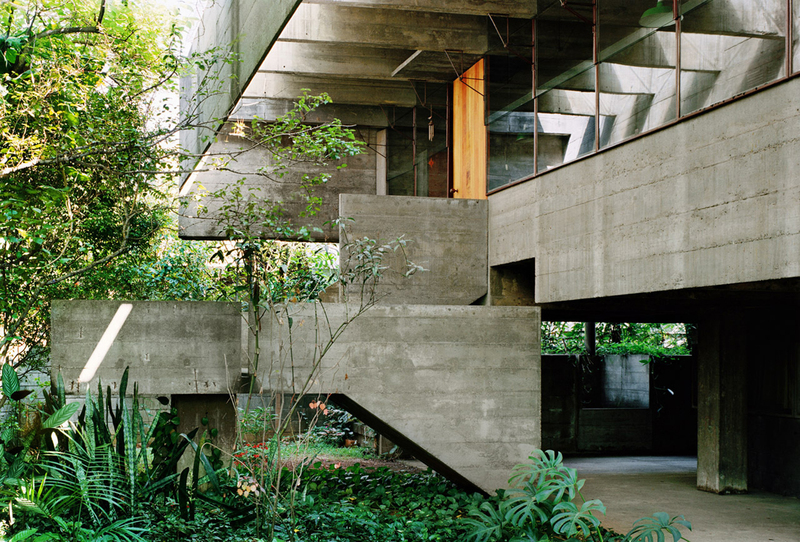 At the very least, exposed concrete has made a comeback. From the neo-Brutalist avant-garde villa to the concrete vase at the flea market, a remarkable revival is underway, sometimes in odd and new ways. But sales of concrete cuckoo clocks are a far cry from saving the buildings themselves. Of course, in times of ever-more-stringent energy efficiency regulations, bare, uninsulated concrete walls are difficult to refurbish without hiding them behind insulation and plaster. But unless due consideration is taken, renovations for the sake of energy efficiency run the risk of burying the most fundamental idea of ​​Brutalism: material honesty. But an alternative is possible, as shown by the extensive restoration and modernization of the town hall in Bensberg, Germany. The problem of the original building’s poorly insulated windows and new energy regulations stretched the restoration team to the limit. But thanks to their careful work and the use new methods, Gottfried Böhm’s “castle” manages to both shine in its old splendor and, with a bit of flexibility, fulfill most of the energy requirements. Brutalism doesn’t have to become the new favorite style of our time. Just a basic increased awareness of the existence of these structures can contribute to their preservation. If you walk past a building for years and never take notice of it, you are not likely to feel its absence. A quite different reaction would come from someone who had consciously taken a look at the building. In the heyday of Brutalism, the architecture of previous generations was widely demolished without much thought. In many German cities, the turn of the century architecture was stripped of its decor or outright demolished at a shocking rate. This inevitably raises the question of whether in fifty years’ time our children and grandchildren will shake their heads and wonder how we could possibly have made the decisions being made right now. Meanwhile, in the context of the renewed appreciation for this style, Goldfinger’s Trellick Tower is undergoing gentrification (after a few repairs). For a new generation, the idea of living in the now iconic skyscraper with its (still) affordable fifteenth-floor view of London is undeniably cool. Older social conflicts are being eclipsed by newer ones: the privatization of housing units is making it increasingly difficult to do restoration work throughout the entire building. Working-class families continue to find themselves being displaced by the new neighbors, and are taking up the political fight against the sale of publicly owned social housing. Today, Brutalism is as political as ever. Whether these buildings can be saved from destruction, and the question of who can and should live in them, will not be decided by architects. Rather, it will be a question for society itself, through political action. Felix Torkar is an architectural historian, freelance curator, and part of the SOS Brutalismus campaign run by the Deutsches Architekturmuseum and the Wüstenrot Stiftung.